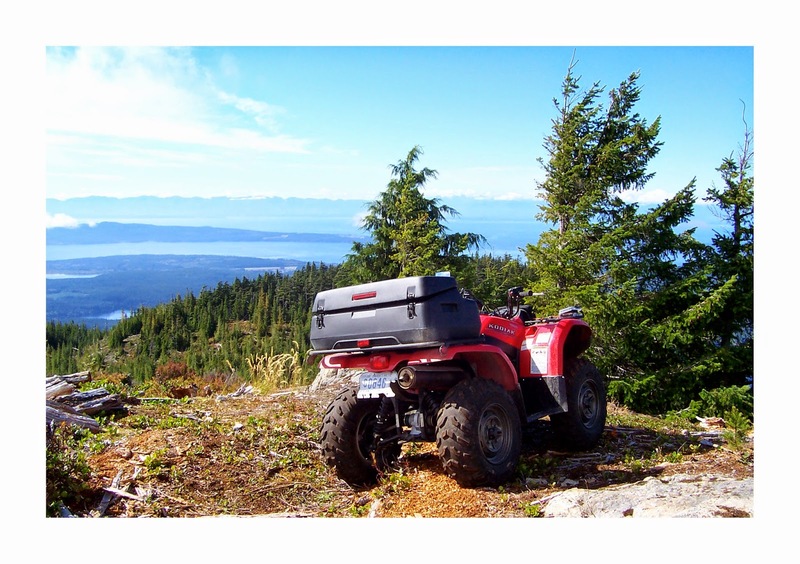 Logging roads around Powell Lake offer lots of quad riding options. Thanks to Western Forest Products, many barge ramps and docks remain, and logging roads are still accessible after harvesting has been completed. This trip was taken using our barge as transportation to get to the at Chip (Chippewa) North barge ramp as the starting point for a ride using new then old logging roads to get to the Theodosia Inlet area on the west side of the ridge. Wayne and I usually go quad riding together, but this time I opted to stay with the barge to hike the lower roads, read, and work on my suntan. The reason, Wayne and our good friend John were going to ride in steep locations and fresh cut areas with steep slopes make me uncomfortable. We put our two Yamaha 450s sideways on the barge to make room for John's big Suzuki KingQuad 750. Configured that way, we had room to spare. The easiest place on Powell Lake to load quads is at Kinsman Beach next to the Shinglemill Marina. We land or barge on the sloping shore and lower the ramps for on and off loads. Except on holidays or hot summer afternoons, it isn't busy. John rides with his big Lab Bro. 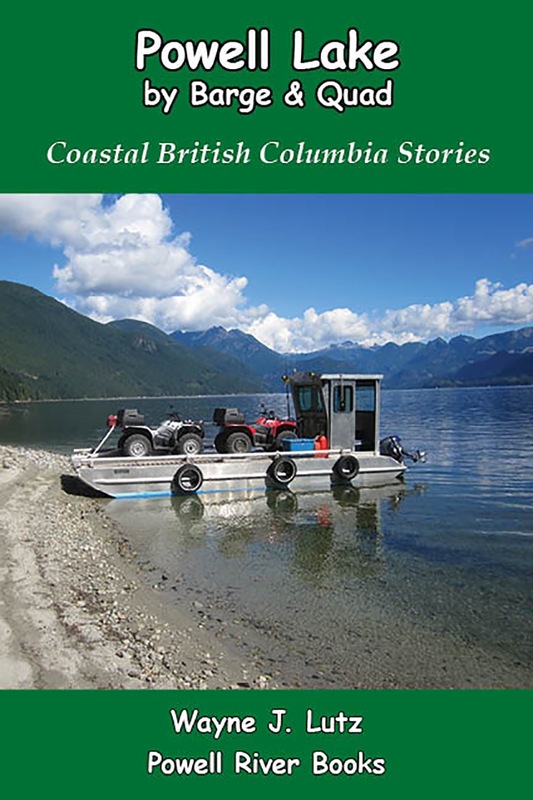 They are well known in Powell River and have been featured in almost all of Wayne's Coastal BC Stories books.. In fact, John has been just about everywhere there is to go, and then some. It's so great when he can be our guide. John built Bro a cushioned aft box where he can sit or lie down to enjoy the ride, but if there's a bear in the vicinity, he's up and howling like an emergency vehicle siren. Chip North is a fairly new logging area with main roads wide enough for the big off-highway logging trucks called Fat Trucks. The barge ramp is in excellent condition. At the time of this post, the dock is usable for a boat, but it has a sunken spot in the middle. It's safe to tie up, but you may get your feet wet on the way to shore. 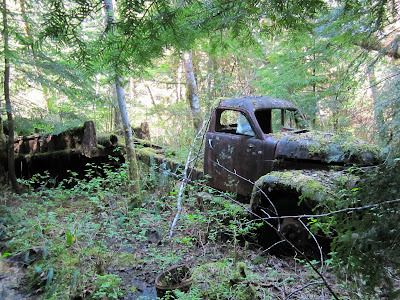 One advantage of new logging roads is the sides are open, affording great views. Here's Powell Lake from the main road that switchbacks and climbs up the steep slope towards to the distant ridge. When the roads get older, trees and vines will grow, obscuring the views. But that makes steep roads more comfortable for me to ride. 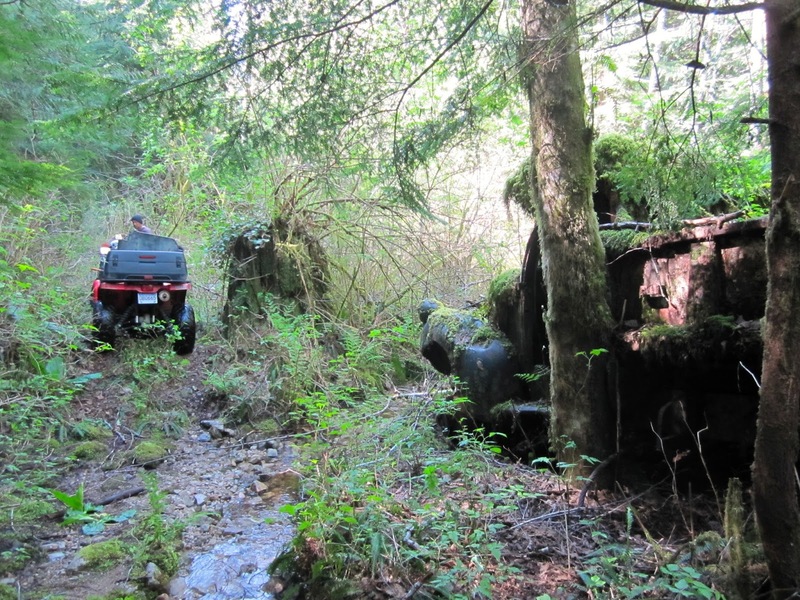 On the upper road near a stream, Wayne and John had to clear a blowdown. At that same stream, John knew about a connection to an older logging road that continues west towards Theodosia Inlet. The old road follows the stream through a valley to Theodosia. With John as the guide, they were able to find the old road and continue. 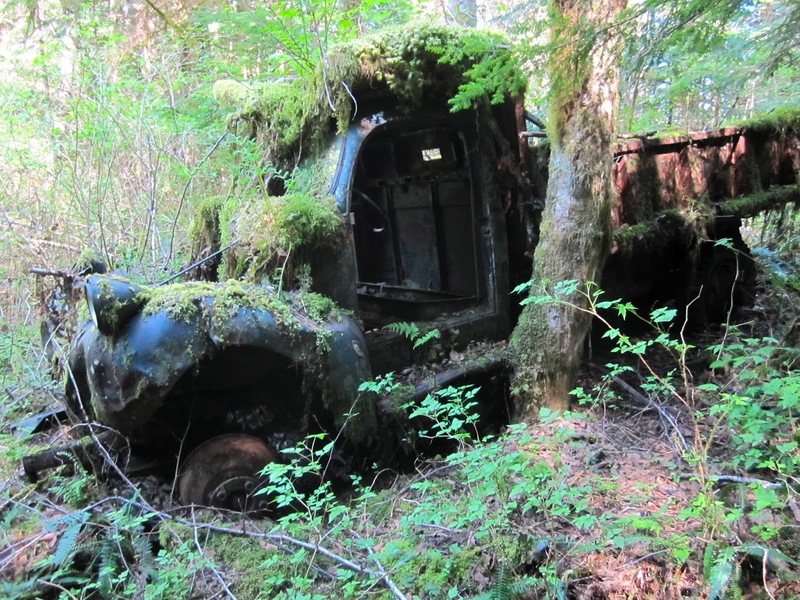 Just before a slash in the Theodosia area, they came upon old logging trucks abandoned in the bush. Such finds are always exciting. 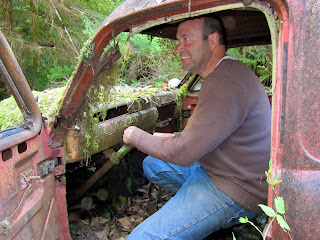 John loves to check out old equipment. He's a wealth of knowledge about what's where. 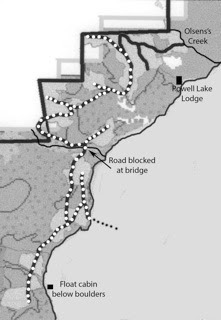 Rather than continue all the way to the inlet, they reversed course. While they rode, I relaxed and read. My only regret was not seeing the old equipment. After the slopes regrow, it'll be my turn.